The Universe sent us a dog yesterday. 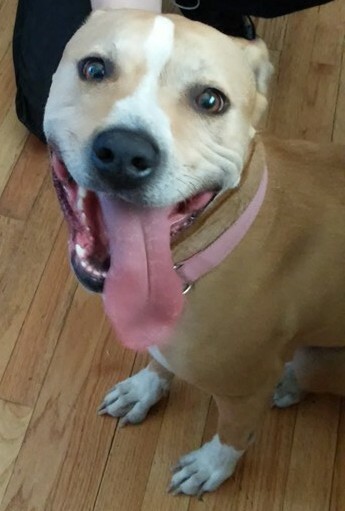 My friend and neighbor was out walking with her son and they found a beautiful brown pit bull. I have never been comfortable with pit bulls. They have such a terrible reputation. But after five minutes with this dog, I realized that some bad trainers/owners have ruined the reputations of some pretty awesome dogs. She is well trained, housebroken and even walks on the leash pretty well. Something our Sophie was never very good about doing. We’ve been thinking about a new dog since Sophie was killed. It’s so hard. We miss her so much. She was our little rescue baby, so tiny and scared when we first took her home. But she quickly became one of the pack, with our old girls, Honey and Scrappy. Now they are all gone. It’s been 16 years since I lived in a house without a dog. I don’t like it. Sure, there’s less pet hair and no accidents and I don’t have to worry about leaving my socks on the floor, but who cares? Yesterday, sitting with Daisy (that’s what we’re calling her) and petting her, feeling her warm weight on my feet – that was pretty wonderful. Made me miss Sophie even more, but also that maybe we’re ready for another dog. I’m not sure about a puppy, though. Somehow it feels wrong to get one of the few puppies available instead of one of the many adult dogs that need a home. I think it might be a nice tribute to Sophie if we found another 6-8 year old dog and gave it the life that Sophie would have had. A forever home where we respect her old age and care for her until it’s time to go over the Rainbow Bridge and join Winnie and Sophie and Scrappy and Honey and Lady and all the other dogs reaching back into our history. And selfishly? It’s a lot less work to bring in a housebroken adult dog who has some basic training than a puppy. They are so cute and so freaking destructive. The cuteness is what saves them when they chew the trim off the cabinets in the kitchen. Or piddle on your favorite rug. Twice. But it’s like bringing home a new baby. They are so helpless that you fall completely in love with them and bond for life. I’ve never had a new dog that wasn’t a puppy. Maybe it’s time to try that. Somewhere there’s a dog that needs a family. And we are a family who needs a dog. It feels like a sign, Karen! He has such a sweet face, too.